How has the US structured itself in terms of equities and debt instruments, and how large is each component? The financial news streams us a constant supply of fragmentary numbers about this or that troubled asset category or rescue package. Since they are all in hundreds of billions or even a few trillions of Dollars, it's hard to get a handle on the relative significance of the numbers. This article provides the comprehensive scope of equities and debt instruments in the United States. That can serve as a sort of yardstick to gauge the relative size of other numbers that are tossed around. Other Bonds 46% (proxy AGG). “Other Bonds” consists of bonds issued by the Treasury, federal agencies, and corporations, as well as mortgage-backed and other asset-backed bonds. That definition corresponds to the Lehman Aggregate Bond index (all bonds over 12-month maturity, and excluding muni bonds). The image below from SIFMA breaks it all down. The total capital value of stocks and bonds in the US, according to SIFMA, was $52.2 Trillion, including $31.0 Trillion (59.4%) of debt instruments. 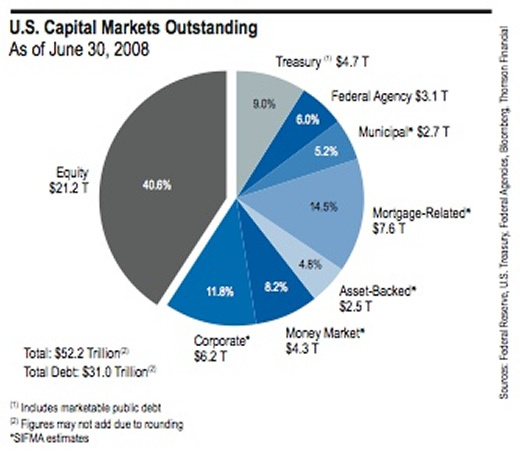 There are, of course, other major non-security assets not represented in the capital markets pie chart. Among the most important are bank savings deposits, equity in real estate (not accounted for in REITs), mortgages and other debts not in mortgage-backed or other asset-backed securities, and the equity in privately owned businesses. Equities have declined in weight since last September, municipal bonds have remained essentially the same weight, while aggregate bonds and money market funds increased in weight. That represents a combination of movement away from risk and a reduction in value of equities. Various accounts put the authorized bailout at as much as $2 Trillion to $3 Trillion. That would be equal to about 6% to 10% of the debt instruments in the US, or 4% to 6% of total equity and debt capital. We will be looking for some comprehensive numbers for derivatives (as we suspect the Treasury is too) and will relate what we find back to the equity and debt capital cited in this article. The most recent GDP reported by the Bureau of Economic Analysis is $14.4 Trillion, or about 30% of the equity and debt capital, or about 50% of the debt capital of the US. Because of the damage done to the stock market since June, the average US portfolio will undoubtedly be higher in bonds and lower in equities, and perhaps higher in money markets. That's not a recommendation to you, but it is potentially helpful to know how everybody else is playing the game.